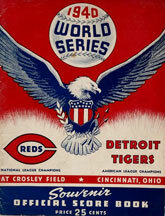 The 1940 World Series matched the Cincinnati Reds against the Detroit Tigers, the Reds winning a closely contested seven-game series for their second championship 21 years after their scandal-tainted victory in 1919. This would be the Reds last World Series championship for 35 years despite appearances in 1961, 1970, and 1972. Bill Klem worked the last of his record 18 World Series as an umpire.